Rated 4.72/5 Stars from 18 customer reviews. Do you own the SSTZ14S-FP? Please, tell us what you think about it. It helps us provide you with better products. Please note that it may take up to 72 hours for your review to appear. Pros: The vendor shipped quickly, product was as described and even had spacers so it fit the application correctly. Cons: the backer nots for the terminals fall out too easy. it could use a remioval strap. I am more than just a motorcycle owner. I am very familiar with the design of electric vehicles and their battery needs. I did, however, buy this battery for my motorcycle. the difference is amazing. 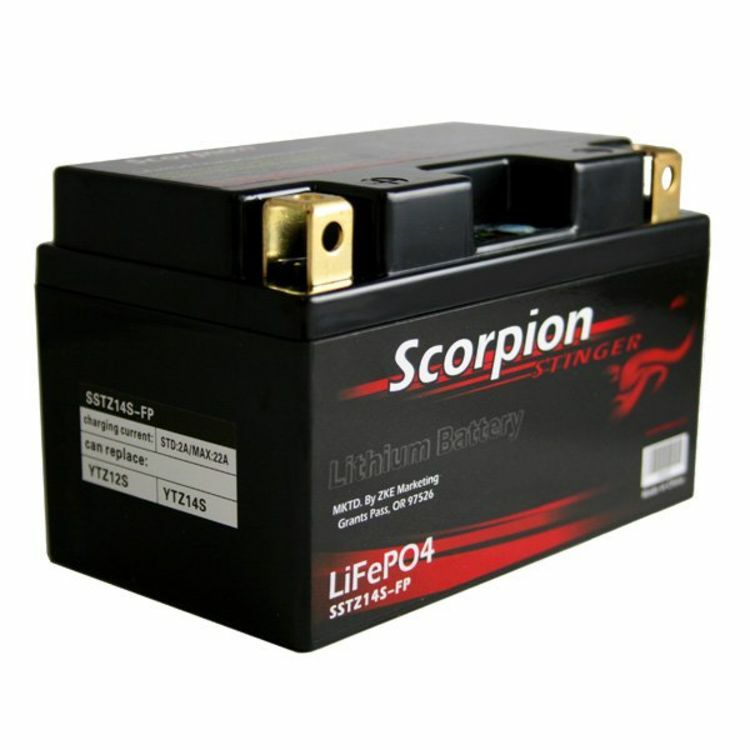 the battery is a featherweight and it has more than twice the CCA of the stock lead acid battery. I like it so much I am thinking about a small electric vehicle based on the technology. Pros: This is a very light battery, yet it has plenty of power. The installation was straight forward with no modifications needed to the connectors or cables. The plastic risers give the battery the correct height so it fits securely in the compartment. Cons: None yet. We need to see how it lasts over the winter. I have a similar dry cell battery in my other bike and I am very happy with the way it hold a charge while not in use. Pros: Fits perfect on my 2009 BMW R1200 GS Adventure, NO modifications necessary. Pros: Shipping was super fast, I was feeling kinda scetchy about the weight because it is practically weightless compared to the OEM lead battery that came stock with the bike, I was a little worried about the size but it was perfect if not a little smaller than the stock battery and I could tell right away it made a big difference in my performance, I used the Scorpion Stinger battery in my 2010 Yamaha R1, and I recommend it to anyone wanting a weight reduction and power increase. 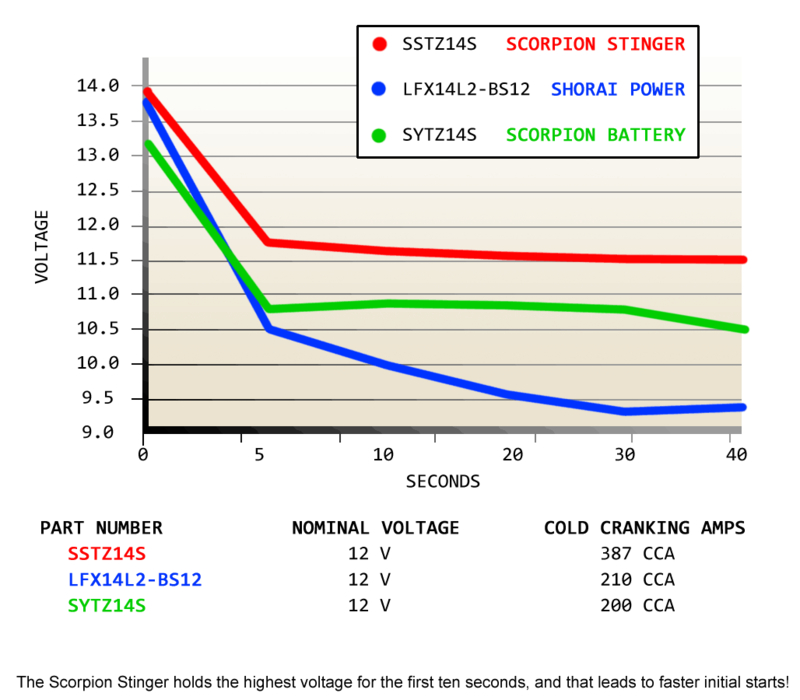 Cons: Local Motorcycle Shops in the area never heard of a motorcycle battery with 350+ C.C.A. (Cold Cranking Amps). I'm recommending it to all fellow riders because this battery is awesome. Pros: Arrived quicklyand fully charged. Very lightweight. Perfect fit for my Honda ST1300. Batterystuff.com makes buying a quick and easy process. Lots of information and your battery arrives in a couple of days ready to go. I would definitely recommend this merchant. 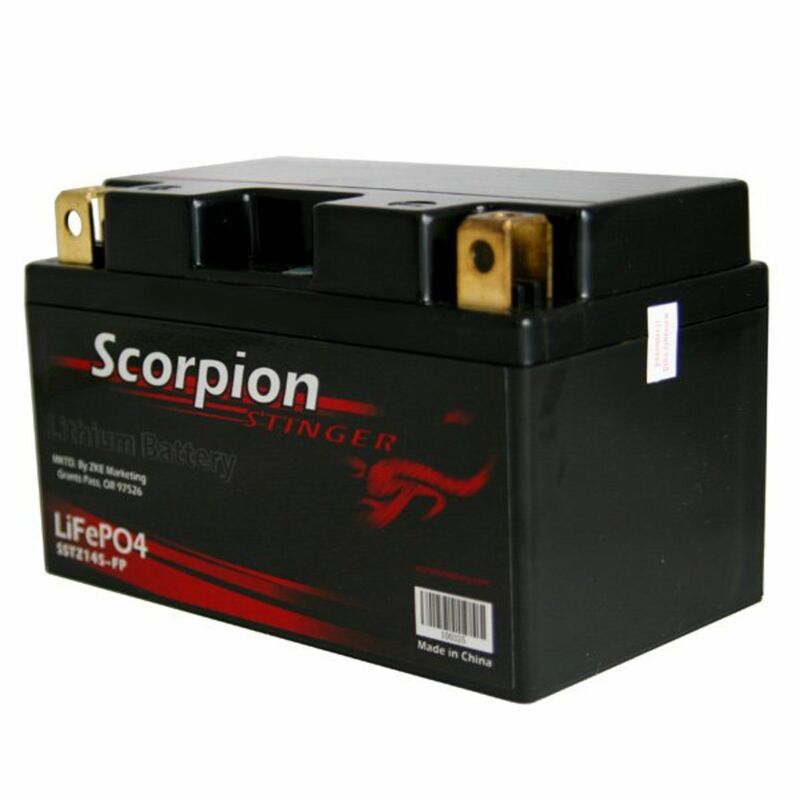 I Have bought a couple of different motorcycle batteries FROM THEM over the last few years. Pros: Great small size and very light saved me about 8 lbs from stock battery. Can be mounted in any position. Fits my Honda Shadow perfect in stock location with the use of the provided spacers. Love the built in batter test light also. I have had it about a month or so and have no complaints at all. I like the fact that this type of battery doesn't need the use of a trickle charger in the off season. Pros: Well when I received box I thought no battery inside it was that light. To my surprise there was, and charged. I put into my 2005 Honda VTX1300R with minor changes to battery box. This girl never cranked like that from day 1 and I bought brand new. I am very impressed. A month and no issues with charging or sitting. Cons: Had to add padding to space up battery in battery box. Ruffly 2 " but nothing that anyone could not do. Pros: I saved a net of 7 lbs between my old battery and this one. 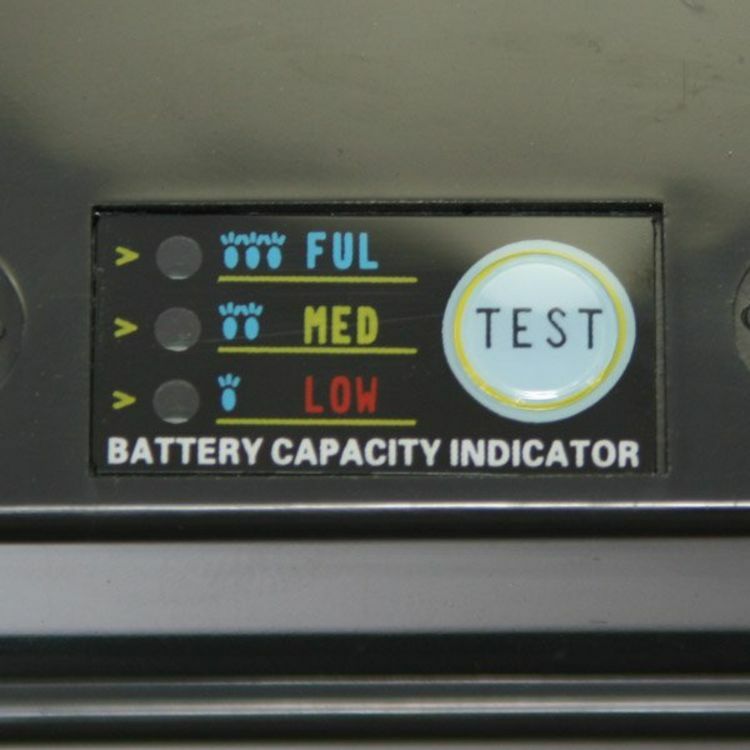 Has a button to check the voltage level. Cons: Can't really get to the button after it is installed, so not much of a point in that, unless you are trouble shooting. Only concern is long term charging and what the actual bike puts out while running. I assume it will be fine. Not sure what to do with my old battery tender, now that I can't use it on this due to the charging voltage difference. Pros: It is light, durable, powerful. 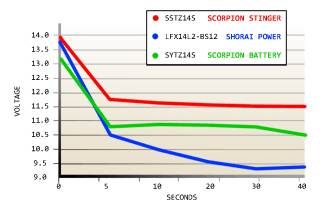 I have this battery on a CBR1100XX which I don't ride that often. At one point it was sitting there for 6 months and it started right up. My neighbor's battery had died on his Subaru. Just for the sake of experimentation I offer him a jump from my motorcycle: again it started right up. I am looking for a new battery for my car now since a I have a two seat I am removing weight. 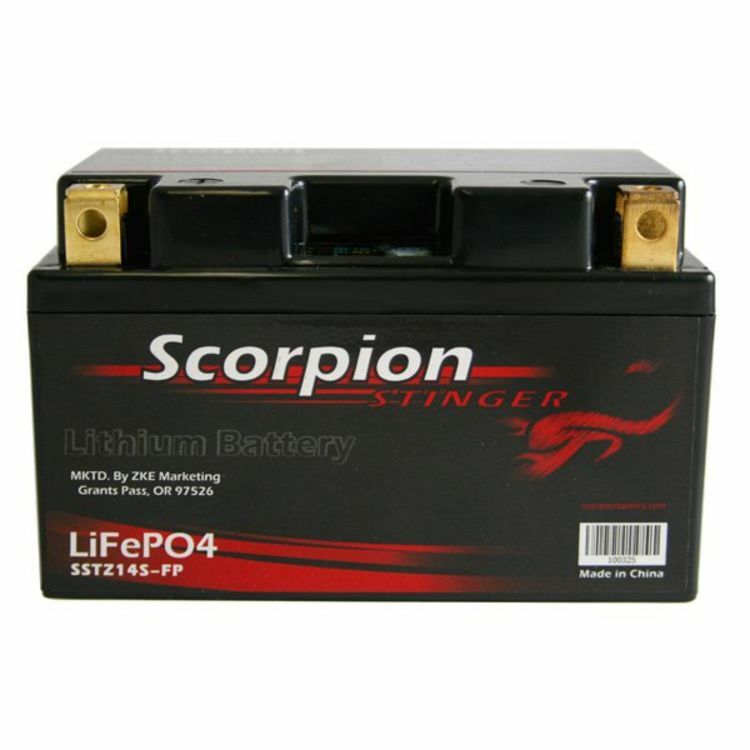 I highly recommend Scorpion batteries. Cons: The box it came in... I thought it was empty cause it was so light. I bought it $10.00 less than the present price. Pros: Light weight and fit are great. I've had this in my 2002 Honda Silverwing for a little over a month and if it lives up to its warranty, it is the best cycle battery I've ever owned. Cons: Cost is high but should last more than twice as long as previous batteries. I am a retired nuclear plant operator and I enjoy newer electric technology. I hope this is a good product. Great so far! Pros: Battery Stuff have excellent customer service. I got my first battery less than three day. It had a defect; it over heated and start bubbling. Call batterystuff and they had me another one two my house in three days. Beside the first one this battery is outstanding. Never had a better turn over in a battery. I have 113 ultima engine and 1.74 starter and this battery gets the job done and this is a great price for a lithium battery. Will definitely buy another battery for this site and the same battery. Highly recommend!! I've been using Scorpion Lithium batteries for several years now and I love them! I use them in all of my street and dirt bikes (Ducati 1199, BMW S1000RR, Aprilia RSV4, MV Augusta F3 800, KTM 350 sxf). I've never had a problem with any of them and regularly recommend them to friends and family. If you're keeping score, that's singles, twins, triples, V4's and IL 4's i've used this patter in. I particularly like the fact that I don't need a special charger or tender for these batteries unlike their competition. Just connected it to any charger or tender and 10 - 15mins later, the battery is ready to go. Pros: Starts my Honda VTR 1000 very well fully charged when shipped. Smaller and lighter than OEM, and I needed small size. Shipped promptly, received everything without damage. Excellent company to do business with. Pros: Excellent weight and CCA are ad described. Performed well in sub 0 Celsius and in heat. Cons: After 2 years, the on board battery tester stopped working. Not a huge issue, but was handy. Still holds a charge but not as deep as it used to. This is my second battery to replace the one I bought previously. Brand new works great but did not last a full 2 years, but I didn't realize while in warranty. I recommend this to others as its super light weight and small with tons of power. Charges quickly and well when it works. For some reason it just isn't holding a charge as long as when it was new and I've been stuck boosting my bike. Pros: Fits my 2015 zx10r perfect. My bike was sitting for almost a month with this battery in there, and the bike fired right up as if it was running yesterday. Much more cranking amps than my other lead acid battery. Moreover, the battery has to sit on its side when installed into the zx10r and when I removed the old lead acid battery there seemed to be some leakage coming from it. With the new lithium battery I don't think I'll have that problem.